It's common knowledge by now that current vice-president Jejomar Binay is eyeing the presidency in 2016. In fact, Binay is currently wooing business tycoon Manny Pangilinan as his running mate. Whether Pangilinan accepts the offer or not is another story. In the meantime, this photo allegedly snapped in Bohol, is currently making its rounds online. 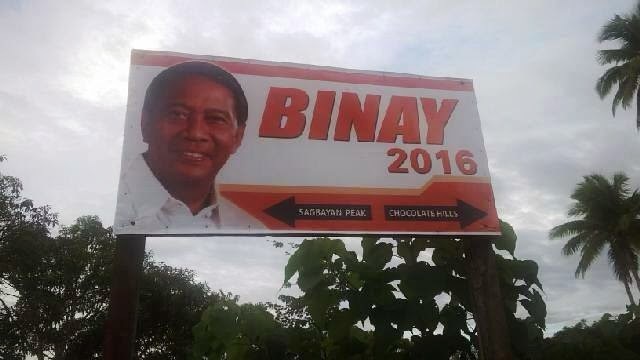 It has a smiling headshot of Binay in it plus "BINAY 2016" in gigantic orange letters. The banner also contained directions to Sambayan Peak and Chocolate Hills which merited people's thoughts that the photo was taken in the province of Bohol. If the photo is real, well, Binay has some answering to do. This is blatant early campaigning, plain and simple. However, to be fair to Binay, the photo doesn't look right. It looks manipulated. The product of somebody's Photoshop skills, perhaps? Anyway, here's the photo. Look at it and you be the judge. What are your thoughts about the banner? If of course it's a real banner and not a product of someone's photo manipulation capabilities. Photo from the Filipino's Patriotism Facebook page.